Shane Greene took the mound Tuesday night in Syracuse, after some unfortunate circumstances. The right hander was optioned to Toledo on June 12 after a series of rocky starts with the Detroit Tigers. 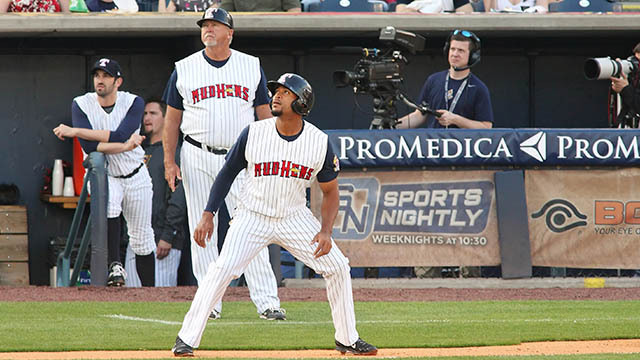 However, Greene made the most of his first Triple A outing of the year for the Mud Hens at Bank Stadium in the second game of the three game set. Greene tossed 7.1 innings, allowing 0 runs on 4 hits with a strikeout. Syracuse's Paolo Espino followed a similar line for the Chiefs against the Hens' offense, hurling 7.0 innings and surrendering 2 runs on 5 hits. Neither starter would end up in the decision. The limited offensive night for both clubs was started in the sixth, when Victor Martinez hit yet another RBI knock , striking a Paolo Espino offering to right for a double. Brendan Harris came around to score on the double, and Martinez finished 1 for 4 in his third rehab appearance. The second run for the Hens crossed the plate on a Dixon Machado sac fly, scoring Miguel Gonzalez. The game was put into the hands of the Hen pen after Greene's exit in the middle of the eighth; and the Chiefs took advantage. In the bottom of the ninth, with Syracuse down to their final out, it was Rick Hague hitting a clutch 2 RBI double off of Hens' closer Alberto Cabrera and sending the game into extras. In the tenth with Angel Nesbitt on the hill, Jason Martinson lifted a high sac fly to left field deep enough to score Darin Mastroianni for the game winner. The two squads are back in action tomorrow afternoon at 1:05 pm in the final game of the series at Bank Stadium in Syracuse.